Directly Impacts Your Ability To Synthesize The Proteins You Eat! Protein synthesis is one of the most vital functions taking place in each and every human body. In order for us to utilize our protein intake in an efficient manner, an ample supply of the amino acid glutathione must be present in our cells. NAC (N-Acetyl Cysteine) is essential in the formation of glutathione, as it directly impacts our ability to synthesize the proteins we ingest. 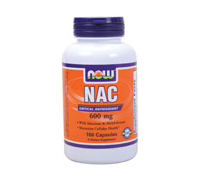 NOW NAC (with added trace elements of molybdenum and selenium) acts as a precursor to the production of glutathione, helps ward off health problems through its antioxidant/detoxification properties and facilitates the production of several digestive enzymes. N-Acetyl Cysteine (NAC) is a stable form of the non-essential amino acid L-Cysteine. It is a sulfur containing amino acid that acts as a stabilizer for the formation of protein structures, and is also a necessary component for the formation of glutathione. Molybdenum and Selenium are essential trace minerals that facilitate the production of several important enzymes. Directions: As a dietary supplement, take 1 capsule 2 times a day.